reaConverter offers a proficient tool for doing batch image rotation using a clear and easy-to-use interface. Save time and effort while rotating images at 45, 90, 180 or 270 degree angles, in a clockwise or counter clockwise direction. 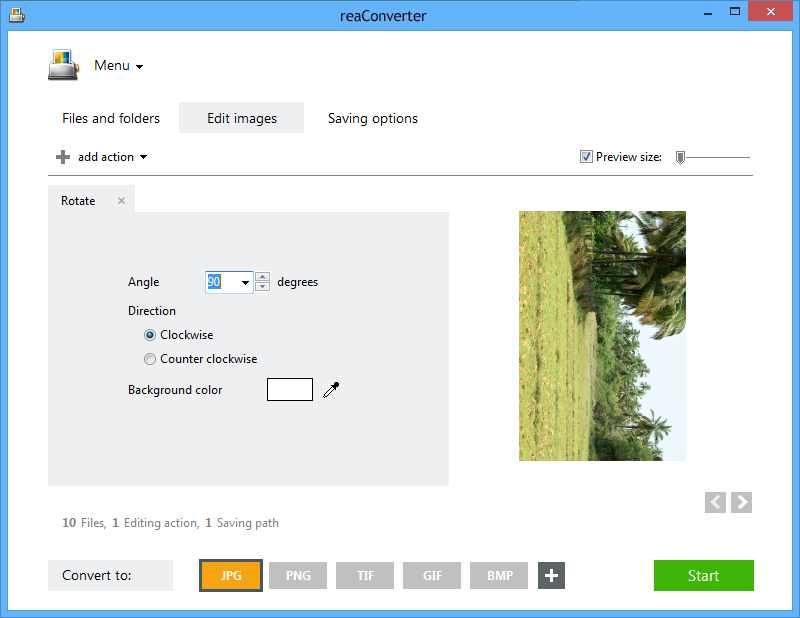 So in case you are looking for a software that helps you rotate one or more images with just a few clicks, reaConverter is precisely what you need. 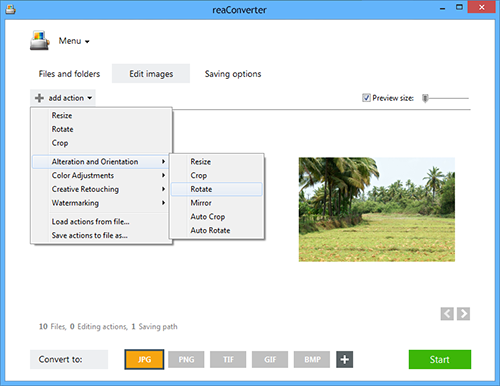 Open one or more image files into reaConverter's main window or drag and drop them here. Adding an entire folder or loading images from text files are also among the available options. Go to the Edit images tab and click on Rotate, either from the shortlist of features or from the Alteration and Orientation menu. Then decide the angle and direction of rotation with 2 easy clicks. In case you pick a 45 degree angle rotation, reaConverter allows you to customize the background of your new image by using a handy color picker on the preview image. Finally, go to the Saving options tab and take a few seconds to choose the location of your rotated images. You can opt for a local folder or save directly online in your Google Drive, Box.com of Dropbox account. Last but not least, decide if you want to keep the file format of the initial image or convert it to another one by simply clicking on one of the extension buttons accessibly placed at the bottom of the window. Choose among JPG, PNG, BMP, TIF or over 40 other formats, including less popular and rare extensions. Press the Start button and get rotated images! Command-line rotating tool is an advanced feature meant for professional use, and is available in Pro edition only.